The skateboard is easy to glide, perfect for either stunt or simple cruising, the Skateboard will get you where you want in style. You can skate it on the road, outdoors, parks and greenways, which is your best choose for instead of walk when you want to shopping, school and skate brush street. Easy to carry and storage. Which have the big wheels so can let you feel very steady. 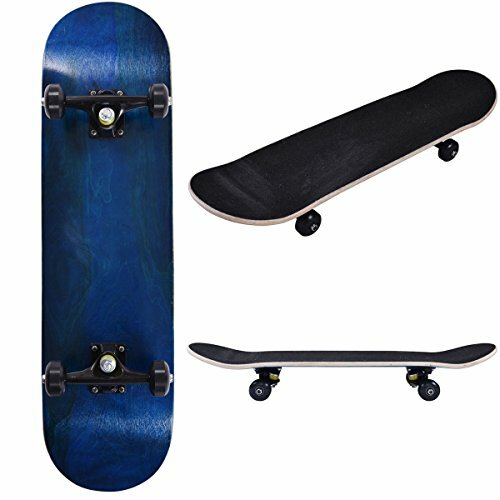 This skateboard is easy and simple to learn, it's great for beginners & for master riders as well. Max load weights 100kg. And this item would also make a wonderful birthday, graduation or holiday gift idea for those skateboard lovers. Our skateboard with car line wheels,it's more comfortable for riding than PU wheels. If you have any questions about this product by patcharaporn, contact us by completing and submitting the form below. If you are looking for a specif part number, please include it with your message. Quest Skateboards super Cruiser Crimson Bamboo & Maple Skateboard, Red, 44"